As some of you may be aware, instead of making resolutions for the new year that I would inevitably fail at, I decided to take on a 52 book reading challenge. You can read more about it here. 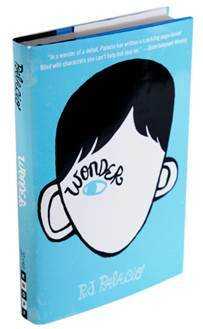 The 2nd book I decided to read was Wonder by R.J.Palacio. The category: A book with a one-word title. I'd had it sitting on my shelf for some time & had heard good things, but I didn't actually know what it was about. I think the initial audience for this book was intended for kids/young adults because it is a very straightforward & easy read...BUT, the story & the message is so important, everyone SHOULD read it, no matter your age. Like I did for my first book review, I'm stealing the summary from Good Reads. I 100% recommend this book to anyone with kids or anyone who could use a good reminder in life not to judge a book by it's cover.